Rockets have not been shot from Lebanon into Israel since the 2006 Lebanon War. Hence the stunned look on our faces when we heard the siren wailing last night on the kibbutz up north and ran to the shelter. We form a circle and proceed to sing, our voices growing louder to drown out the sirens. We sing Hebrew folk songs, liturgical songs, and American pop songs. The Israeli campers hum along if they don’t know the words; the Americans ask the Israelis to translate the Hebrew when they encounter an unfamiliar word. Arms are wrapped around one another in embrace, hands clasped in support. I cannot help but marvel at the strength of these young people and the bond they feel for each other, regardless of the fact that they live their lives thousands of miles apart. The kids with whom I sit in the shelter hail from all across Israel and the United States. These are the kids of Camp Koby. There are 120 children, ages 9-17 and they have come together to spend the summer at a camp named in memory of Koby Mandell, an American teenager who had immigrated to Israel with his family from Maryland and was stoned to death by Arabs in 2001 alongside his friend Yosef Ishran near their home in the settlement of Tekoah, near Jerusalem. The Mandells have made it their life’s mission to help Israeli children who have become victims of terror. The Camp they founded is intended to be a place of safety and security and just plain fun for children who have either been injured by terrorist attacks or whose families have suffered in terrorist attacks. Camp Koby also brings American teenagers to Israel each summer to work as junior counselors at the camp. I am one of the senior counselors at the camp. The Americans who have traveled to Israel this summer to work at Camp Koby are only 16 years old and have never faced terrorism. Before this trip, Hamas and Hezbollah were just words they learned about in school or occasionally saw in the newspapers. Over the last few days they have had a crash course in terrorism. And I see the fear in their eyes. These teenagers have a tremendous responsibility; they must care for their own safety, and at the same time keep track of their Israeli campers. But when the siren blares, there’s confusion. Do they grab hold of their campers as they race to safety, or do they simply run? Tonight as we made our way to the shelter, I saw a combination of both. But I also saw something that I did not expect: the Israeli children comforting their counselors. From my spot in the bunker I can see a group of Israeli youngsters singing songs of encouragement to a clearly distressed American teen. A few seats over a young boy from the southern town of Sderot is telling his counselor that this is an “experience” not dissimilar to what he has endured on countless occasions growing up in the Israeli town that has borne the brunt of the rockets from Gaza over the past several years. And then there is the Israeli teen who calls out “Am yisrael chai!” (Israel lives!). Americans and Israelis alike begin to chant that the strength of Israel will never die. The Israeli kids of Camp Koby who have suffered so much in their young lives give me my strength. I sit inside this bunker, and I am not thinking about Hamas or Hezbolla, or about the rocket that just fell a few kilometers from us. I am thinking about how proud I am of these children, and of the American teenagers who are also my charges this summer. We are the kids of the bunker, and this wave of rocket attacks fuels our passion for Israel and cements our unity. Our enemies are trying to weaken us, but instead their efforts give us strength. Talia Lefkowitz is a student at Barnard College in New York. 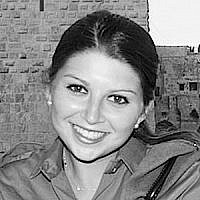 Prior to her studies she served as a sergeant in an elite paratrooper force in the IDF.